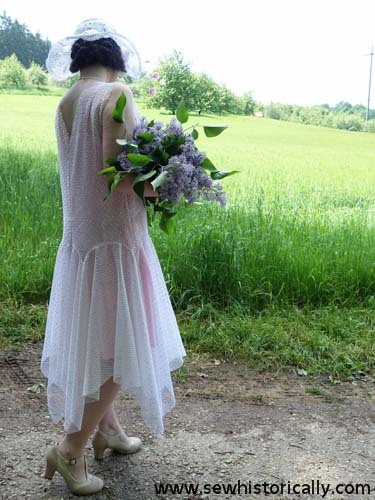 That’s my mid-to-late 1920s white lace afternoon dress. My lace dress is calf length. Not all mid-to-late 1920s dresses were knee length: afternoon and evening dresses sometimes were longer, like this 1920s summer dress autochrome (the second picture) and this 1927 sheer summer dress. 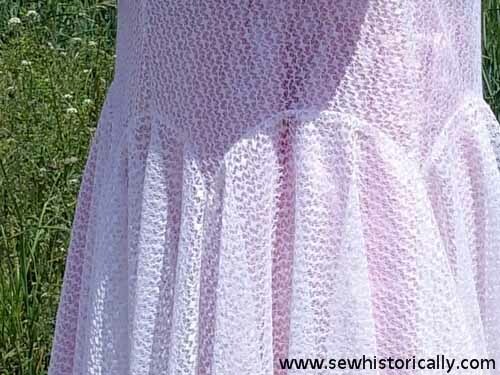 I used the same shiny white and cream-colored lace which I used for this 1920s lace dress. And here’s a shiny ivory lace dress from the 1920s. 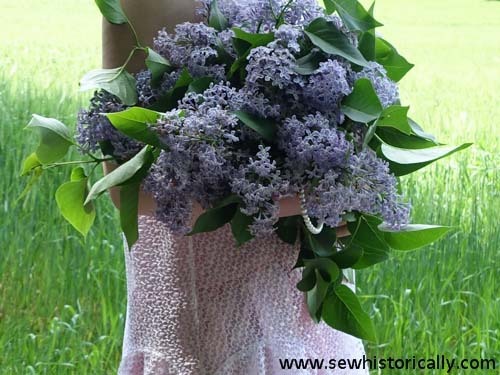 The 1920s autochrome of Bibi in Nice by Jacques-Henri Lartigue inspired me to photograph the lace dress with a lilac bouquet. The dress has a V-neckline at the front and back. Two 1920s V-neck lace dresses: cream-colored Vionnet lace dress and white mixed lace dress. … and a handkerchief hem. 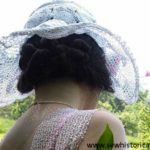 This dreamy 1920s photograph of a woman with a sheer summer cloche inspired me to take some photos under a willow tree. 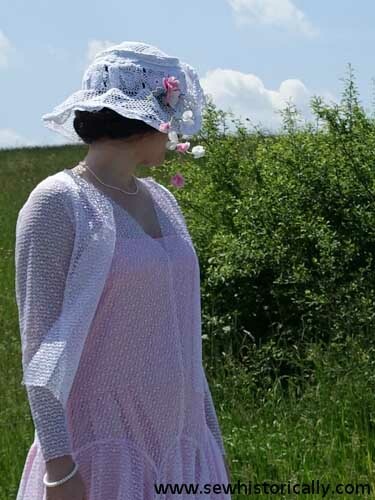 I’m wearing the lace dress with my white crochet lace summer cloche. Here’s a 1920s autochrome of a wide-brimmed summer hat and a 1920s pineapple crochet lace hat. 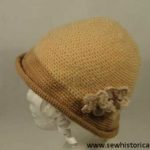 For the hat I used scraps from my DIY crochet lace skirt. 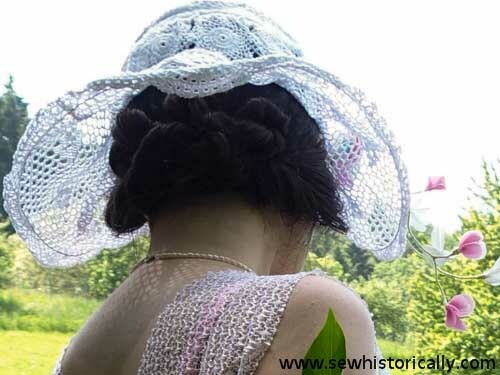 My crochet lace hat is trimmed with my DIY silk and rayon flowers. I pinned my long hair into a bun. If you’d like to recreate the hairstyle, I’ve written a tutorial for this authentic 1920s hairstyle. I also made a matching sheer lace jacket for the dress. 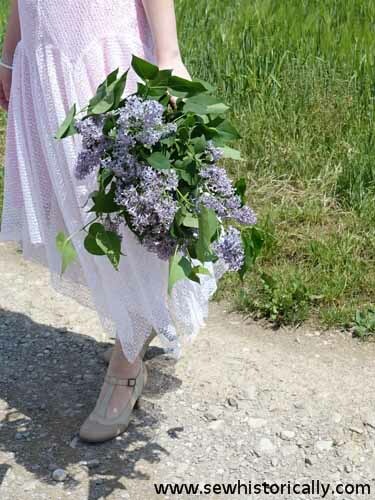 I used the same lace as for the dress. 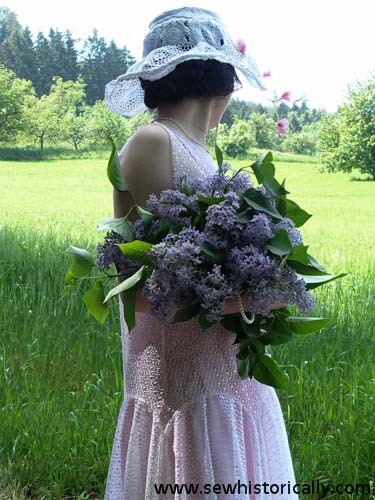 My lace jacket is mainly inspired by this pretty 1928 Hattie Carnegie tulle dress with jacket. And two more 1920s lace dresses with matching jackets: cream-colored 1920s lace dress and white silk rayon lace dress. Because the dress is very sheer, I’m wearing my pink satin slip underneath. Here you’ll find my pinterest board ‘1920s Fashion & Accessories‘. I love this dress! Definitely something that would be fun to wear throughout the summer months. Thanks, Susan! 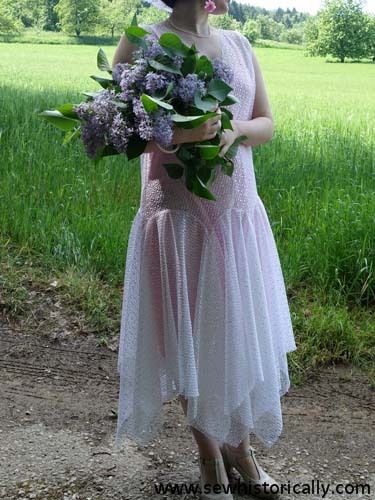 🙂 The dress is more a spring dress. 😉 Despite the lacy look, it’s warm and heavy!